*Oasis Marigot* is a small resort community consisting of 12 quiet and private sea houses perched on the green hillsides of Marigot Bay. Each 2-storey cottage features an upper level kitchen and bathroom, plus a lower level master bedroom. A large set of double French doors in the bedroom lead to a spacious covered balcony with a spectacular view of the bay! Here, guests can relax and feel the refreshing tropical breezes as they watch the yachts, sailboats, and kayaks glide along the waters. The resort offers sailing excursions to nearby deserted beaches and snorkeling adventures for visitors looking for a more interactive vacation experience. 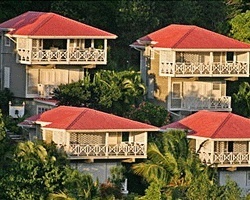 For more information about this resort, visit www.oasismarigot.com. Clear Title! Enjoy a wonderful family vacation in the great outdoors! Choose your floating week! Make an offer today! 4 floating weeks per year! 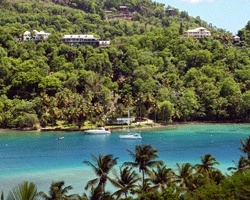 Hillside cottage overlooking Marigot Bay! RTU is in perpetuity. 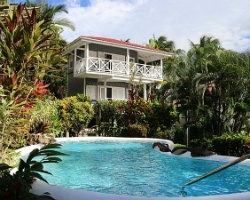 Relax in your own private villa overlooking Marigot Bay! 4 weeks of Vacation every year! Buyer may receive a title fee credit, inquire for details! 2 weeks per year! 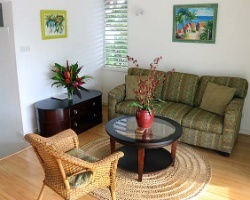 Relax in your very own tropical cottage in St Lucia! Buyer may receive a title fee credit, inquire for details!